I don't know about you guys, but sometimes I get intense cravings for something crunchy AND buttery! And in those desperate, dark hours...I turn to phyllo dough! So simple and so easy...all you have to do is thaw it out overnight, and voila'! It's ready to be used! I'm pretty sure it's foolproof too, because I've used almost EVERYTHING as a filling, and it always comes out delicious! In my phyllo rolls, I like to add a touch of saltiness by using thin slices of prosciutto. You can add regular ham, turkey, or even omit the meat in it, altogether! Start off by adding in some olive oil into a hot skillet. Add in your chopped shallots, along with a small pinch of salt. Cook until soft and tender. Add in your spinach, chopped mushrooms, and your cream cheese. Cover and allow to cook until wilted. Remove lid, stir, and then remove from heat. Place your spinach mixture into a colander to drain any excess liquid. Then, add in your bread crumbs and mix well. Next, add in your cheeses along with chopped chives, and mix well, again. Set this aside. Take one sheet of phyllo dough(with the long side facing you), and place it on a baking sheet. Using a pastry brush, spread a generous layer of melted butter, right on top. Repeat with the remaining phyllo sheets 9 MORE TIMES, but instead, use some BUTTER FLAVORED COOKING SPRAY, to cut back on some calories. Next, take your prosciutto and place them horizontally, at the long end, closest to you. Place your spinach mixture, right on top of the prosciutto. Make sure to leave at least a half inch border on the short sides of the phyllo. This will keep most of your filling from oozing out, while baking. Begin to roll it up(jelly roll style), until nice and tight. Don't forget to brush on some melted butter to the outsides, as you are rolling up. Make sure you end with with the roll, SEAM SIDE DOWN. Using a sharp and serrated knife, begin to make 1 inch slashes across the dough. Try not to cut all the way through...you don't want too much cheese to ooze out during baking. Place into oven and bake for 30 minutes. Remove from baking sheet, place it on cooling rack, and allow it to rest for 15 minutes before cutting into it. Slice, and serve immediately! Watch my video here to see just how easy it is to make! Usually, I'm not CRAZY for American buttercream because of how overly sweet it is, but for this recipe...I think I could make the exception. :) The important thing to note is, to always use good butter with at least an 80 percent butterfat content. I like to use Darigold's Chef's Choice Salted Butter. It's affordable and you can find it in most grocery stores. It's a European style churned butter and most European butter runs up to 82 percent butterfat content. That'll ensure that your frosting is nice and creamy!! Take your softened butter and add it into your stand mixer fitted with the paddle attachment. Beat on medium high for 6 minutes, scraping occasionally. Stop the mixer, and add in your mashed bananas, lemon juice powder, banana extract, and vanilla extract. Continue to beat for 1-2 more minutes. It's okay to see small chunks of banana in it. I think that's a good thing! :) Stop to scrape the bowl. Turn speed to "stir", and add in your powdered sugar by the cup. Once fully incorporated, turn the speed up to medium and beat until smooth..about 2 more minutes. Add in your heavy cream if you want it slightly creamier. Baking bread is definitely an art form in itself because a lot of things factor into how your bread will turn out, like humidity. If you've ever come across a recipe that says "about" 5-6 cups or so, it's because flour reacts differently in their ability to absorb moisture. That's why I like to use the food processor(although I'm sure some professional bakers would disagree) because it allows my recipe to stay pretty consistent. When kneading by hand or with a stand mixer, I always feel the need to add more flour because of the "tackiness" of the dough but in my years of bread making, slightly tacky and wetter dough will result in a softer/lighter loaf of bread. Why don't I use bread flour? Although bread flour is awesome to use because of it's high protein content(which results in a beautiful rise) it will also yield a more chewier loaf so that's why I use all purpose flour. It's very important to add the vital wheat gluten which gives the overall loaf great structure and helps it stay risen. Oh, and fyi if you were trying to find a homemade bread recipe that stays soft for days, well let me tell you, that YOU AREN'T GOING TO FIND IT! That's the beauty of making it yourself--you know EXACTLY what's going in it! Grocery store bread and such use additives and enzymes to their dough to increase shelf life. I use diastatic malt powder only to add softness to the overall texture of the loaf. * For the dry milk powder, I recommend that you purchase it from King Arthur's website! It's called Baker's Special Dry Milk Powder and it's nothing like the ones sold at your local grocery store. For starters, it's a lot smoother and finer in texture and not gritty. I don't know what's in that stuff but it makes the bread waaay softer and lighter! * I also purchased the Diastatic Malt Powder and Potato Flour from the King Arthur website. Both of these items are crucial in this recipe because they make the bread lighter/fluffier and not dense like most recipes! Try not to leave these things out! I will post a link below that will take you directly to their website! Start off by sprinkling your yeast into your warm water. Make sure it isn't too hot-you don't want to kill your yeast. Give it a little stir and then add in your sugar and stir one more time. Allow to sit until mixture becomes creamy or when you can see the yeast kind of "sprouting" on the top of the surface(at least 5 min or so). Now, you know that your yeast is "alive". While you're waiting for your yeast to wake up, add your all purpose flour, diastatic malt powder, potato flour, and vital wheat gluten into a large mixing bowl. Mix to combine. When your dough is activated, give it a quick stir to loosen up the sugar that has fallen to the bottom of the bowl, and pour it into your dry mixture. Using a wooden spoon, mix until well combined. Add in your salt last(yeast doesn't like salt but adds flavor)give it a another quick mix, and then add your dough into the food processor. Pulse for 1 minute. Turn off food processor and slightly flatten out the dough and then slather on your softened butter. Take your hand or butter knife and bring some dough over the butter. Pulse for 30 more seconds. It's easy to over knead dough in the food processor so stay close. Place dough onto a clean work surface and working with very fast hands, form it into a nice smooth ball. Don't overdo it. I recommend NOT adding any additional flour to your work surface unless you absolutely HAVE TO! When you begin to work with the dough, you will notice that the stickiness of the dough will start to smooth itself out. Place dough into a bowl and add a small amount of vegetable oil. Place your dough in the bowl and toss to coat. This will prevent a crust from forming at the top of the dough. Cover with saran wrap and allow to double in size. This can take anywhere from 45 minutes to over an hr depending on your weather conditions. A warm and draft free place is recommended. Once doubled in size, take two fingers, lightly press them into some flour, and then poke the top of the dough--if your indentations stay, then your dough if ready to be rolled out. Take dough and place on clean work surface and punch it down the middle. Sometimes I give it a few small punches to release some of the large air pockets that have formed within the dough. Using a rolling pin, gently roll it out and then shape it into a log(if you notice your dough sticking, lightly flour your rolling pin to get the flow going). Pinch the seam together and roll it over itself with the seam side down. Pinch and seal the two ends as well. Take some vegetable oil and lightly coat your bread pan but don't overdo it. Get in there with your hands and make sure that the sides are well coated as well. Take a piece of saran wrap sprayed w/ some baking spray and cover your dough. Allow to rise one more time until it has risen to at least half an inch to an inch high above the sides of the pan. There is such thing as letting it rise too long. If you over did it, the dough will collapse and you will end up with a brick! Place a cast iron skillet on the bottom of your oven. Turn your oven to 350 degrees. Once done preheating, remove saran wrap from loaf and gently slide it into the oven. Take about 5 ice cubes and add those into the cast iron skillet and close the oven door. Don't slam it, you don't want to disturb your dough. That steam from the ice cubes will give your bread a nice rounded "dome" like shape and a beautiful brown crust. After about 15 minutes, remove your cast iron skillet cause it won't do any good in there at that point. Bake for 25-30 minutes(tap the bottom of the pan-if it sounds hollow it's done). If the tops get too brown for your liking, you may tent it with some foil for the last 10 minutes. I like it when the crust is really brown so I never tent it. Remove from oven and immediately place onto wire racks to cool completely. Brush the tops with melted butter and allow to cool for one hour before slicing. If you slice into them too soon the texture of the bread will be sort of "gummy" in texture. Slice and enjoy!! If you're starting to bake more often I would highly recommend purchasing a electrical knife for nice and even slicing. I have one by Black and Decker that I am in love with! No more sloppy pieces of uneven bread! Also the bread will stay soft for up to two days on the counter. One loaf for my house lasts only for a day so it works out perfectly in my favor. Keep it stored in a tight paper bag and away from sunlight and only cut what you need. Make your watermelon ice cubes and place them in an ice tray. Put them in the freezer and allow them to set overnight. 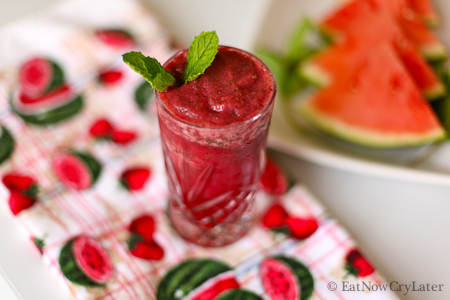 The following day, place 7 watermelon ice cubes, pomegranate juice, lemon juice, and Stevia powder(if using), into your blender and pulse until smooth. Add more pomegranate juice as needed, to get your motor running. Stop the motor and give it a little stir. Then proceed to add in your mint leaves and give it a few pulses. Don't overdo this, because you want to be able to see specks of green mint throughout your slushy. Repeat steps for another 8 ounce drink! Watch how to make it here. To make the crust, place your flour, pecans, salt, and sugar into a food processor and pulse until your pecans are finely ground. Add in your cold butter, and pulse some more until the mixture resembles corn meal. With the motor still running, add in your ice cold water, until the mixture comes together, and start to form a ball. Start off with 1 tsp of water and then add more if you need to. Turn out your dough onto a piece of saran wrap, flatten it out into a disc, and then chill in the fridge for 20 minutes. Remove your dough from the fridge and divide it into 3 equal pieces. Place the dough into your mini tart pans and press into an even layer of the pan and also up along the sides. Freeze until firm, about 15 minutes. Place your pans on a baking sheet and line the crust with foil. Fill them with dried beans or pie weights and bake for 12 minutes. Remove the foil and dried beans and continue to bake until golden brown, about 8 more minutes. Transfer onto a wire rack to let them cool completely. Next, make the glaze. Place your apricot jelly and water into a small saucepan and cook over medium low heat. Once your jelly has melted down(about 10-15 minutes), strain the mixture and set aside for later use. To make the filling, whisk together your egg yolks, 3/4 cup of milk, 3 Tbsp of sugar, a pinch of salt, and 2 Tbsp of cornstarch. Set aside. Next in a small saucepan, add the remaining 1/2 cup of milk, 4 Tbsp of sugar, and 1/2 tsp of vanilla bean paste. Bring this mixture to a simmer over medium heat. While whisking, take your hot milk and pour a little bit into your egg yolk mixture(this is called tempering). Keep whisking and slowly start adding in small dribbles of the hot milk, until half of it is mixed in. Now, you may start adding in steady streams until everything is mixed in. Strain the mixture back into the saucepan and cook over medium heat, whisking constantly, until the mixture becomes thick(it should resemble the texture of yogurt). Remove pan from heat and whisk in your softened cream cheese. If you did not use vanilla bean paste, this is where you may add some vanilla extract. Place filling into cooled crusts and put them into the fridge while you work on your chocolate hearts. You may also pour the cream cheese/pastry cream into a bowl, place saran wrap directly on the surface, and refrigerate until ready to use. For the heart shaped chocolate hearts: Follow the directions on the packaging and melt your candy melts in the microwave. Stir and then place it into a disposable piping bag. With a pair of scissors, snip a tiny bit off, and then pipe a heart onto your silpat or parchment paper that has been placed on a baking sheet. Fill the heart with more chocolate and smooth it out using a toothpick. Give the pan a few whacks on the counter to release any air bubbles that may have formed. Refrigerate until set. How to make the royal icing: Place your egg whites into your stand mixer and beat on medium low until frothy. About 2 minutes. Add in some powdered sugar in batches until all mixed in. Add in your vanilla extract. Stop the mixer and scrape down the bowls a few times to remove any large lumps. Continue to beat until smooth. Add in some water if it's too thick or more powdered sugar if it's too thin. You want to be able to pipe some out for writing. Place Wilton tip #1 or #3 into a disposable piping bag and put some royal icing in it. Twist and secure tightly. Remove your chocolate hearts from the fridge and write a sweet message on them. Place them back into the fridge to set. This recipe is a MUST try for all FISH LOVERS!! And talk about a fancy looking way to dress up an inexpensive fish! Every time I serve this, I get rave reviews before anyone even takes a bite! The presentation alone, is enough to want to make you want to dig in, HEAD FIRST. The soy sauce glaze that goes on top of this fish is SO FINGER LICKIN' GOOD!! The addition of ginger and carrot slices, cooked in brown sugar, shallots, and garlic, make this sauce OUT OF THIS WORLD! 1.5 ounce of ginger sliced into thin 2 inch strips(julienne). 1 small carrot cut into 2 inch strips. (I just used a julienne vegetable peeler to make the strips). Chop up your garlic and onion and set aside. Next, slice your ginger and carrots into thin 2 inch strips. I have an awesome stainless steel julienne peeler that I purchased through Amazon that I used. Clean your fish thoroughly and pat dry. Make three diagonal slashes on each side of the fish. Season lightly with salt and pepper and then coat your fish in wondra flour. If you don't have any wondra flour you may use cornstarch instead. Heat a large skillet/wok on medium-medium high heat and put enough oil to submerge half of the fish. Fry until crispy/golden brown about 6-7 minutes depending on how large your fish is. Flip your fish and continue to fry for another 5 minutes or so. Remove and place fish on platter. In a small bowl mix together your water, soy sauce, salt, brown sugar, hoisin, and black pepper. Mix to combine and set aside. On medium high heat add some oil into a saucepan and add in your chopped onion. Cook until translucent. Add in your ginger, carrots, and garlic. Cook until fragrant and until everything has softened. Add in your soy sauce mixture and cook on medium high heat for about 2-3 minutes tops. Take some cornstarch(about 1 tsp)and mix it with a bit of water. Add the cornstarch mixture to the saucepan and stir to combine. Turn off heat and your glaze is ready!! You may up the cornstarch mixture if you prefer a thicker glaze. Pour your glaze over your fish while it's still warm and serve immediately!! Garnish with thinly sliced onions, scallions, parsley, or cilantro! 284 grams of cold, unsalted European style butter(recommended Plugra)for laminating. Place a little bit of flour onto a clean work surface and shape your dough into a smooth ball. Your dough should be slightly tacky. Place dough in the fridge, and allow to chill for about 30 minutes. Next, take a large piece of parchment paper, and using a ruler, measure out a perfect 8x8 inch square, right smack in the middle of the parchment. Make sure you have enough to fold over all four sides...you'll need it to trap in your butter as you're rolling it out flat. Set it aside. Next, lightly flour your work surface. Remove your chilled butter from the fridge, and with a lightly floured rolling pin, gently pound it until it is relatively flat and slightly squared. Place your butter into middle of your parchment(8x8 inch)square, and fold over all four sides of the parchment paper, to fully encase the butter. Flip it over and begin to use your rolling pin to flatten out the butter into a thin, perfect 8x8 inch block of butter. Once complete, place your butter back into the fridge to chill. On a lightly floured surface, remove your dough from the fridge and gently roll it out into an 8x16 inch rectangle. Use a pastry brush to brush off any excess flour. Transfer the dough onto a parchment lined baking sheet, cover completely with another piece of parchment paper, and place it into the freezer for 30 minutes. Fill two gallon sized freezer bags with ice, and place them on your work surface for 15 minutes. Remove the ice bags and wipe your work surface, making sure that the surface remains dry. Also don't forget to place your rolling pin(and ice bags)back into the freezer when not in use. Take your chilled dough out of the freezer and place it on a lightly floured surface. Remove your thin sheet of butter from the fridge and using your finger, touch it and then touch the dough to make sure they are of the same consistency. If your butter is harder than your dough, then wait a few minutes before proceeding with the next step. If your butter is a lot colder than your dough, then you risk tearing your dough while rolling and that'll result in less, flakey layers. When ready, place your butter in the middle of the dough and then fold the bottom half up, toward the middle, and then repeat with the top half, making sure that they perfectly meet in the middle. If you need to, trim off any excess dough to make it even. Take your chilled rolling pin, and give it a few gentle whacks. Then turn your dough, 90 degrees and give it a few whacks again. Measure it...does it come out to 8 inches across? If so, proceed by rolling your dough(starting from the middle), and using long single strokes, roll it out to an 8x20 inch rectangle. Don't forget to turn your dough 180 degrees, and repeat rolling it out. Next, bring the bottom half 2/3 of the way up and then fold the top 1/3 down. Brush off any excess flour BEFORE you continue folding. Then, fold the whole thing in half, turn the dough 90 degrees again, making sure that the "spine" of the book is to your left. Give it a few gently whacks again to stretch out the dough and then tightly wrap with saran wrap. Place it into the fridge for 1 hour. You've now completed your first, DOUBLE BOOK FOLD. Remove your chilled dough from the fridge and place it on your lightly floured, well chilled counter. Let it rest for 5 minutes to relax the gluten a little bit. Using a cold rolling pin, repeat the same process and roll out your dough again, into an 8x20 inch rectangle. This time, you're going to fold the dough "letter style", by bringing the bottom third up and then fold your top third down. Turn your dough 90 degrees, give the dough a few good whacks, and then tightly wrap with saran wrap and place into the fridge for another hour. Now, you've just completed your SINGLE BOOK FOLD(or simple turn). Remove your dough from the fridge and let it rest for 5 minutes before proceeding. Roll out your dough again(is your counter and rolling pin cold? ), to make another 8x20 inch rectangle and then repeat the process for another, DOUBLE BOOK FOLD. Place your dough back into the fridge, put something heavy on top of it to prevent it from rising any further, and then let it rest overnight(or for 12-18 hours). The next day, remove your dough from the fridge and then place it into you freezer for about 15 minutes. Then, cut the dough in half, rewrap it tightly with saran wrap, and place half of it back into the fridge. With the other half, on a lightly floured and chilled counter, roll out your dough into a rectangle about 1/8-1/4 inch thick. I always forget to measure this part but it's about a 14x6 inch rectangle. If your dough is too elastic, place it into the freezer for about 15 minutes(or until firm). Using a ruler cut out even triangles with a 4" base and a 6" height. Your triangle should feel cold and firm. Make a tiny slit at the base of your dough and begin to roll it up. Place your rolled croissant on a good thick baking sheet, lined with Silpat. Also, you'll need to bake these off in two separate batches. Make sure you space them evenly apart because they will rise during baking. If you're using a cheap baking sheet and don't have Silpat, then double pan your baking sheet and just use parchment paper. Doing so, will prevent the bottoms of your croissants from burning. Once you're done rolling them all, cover lightly with saran wrap(I prefer to use a clear waste basket liner), and allow them to proof in a cool area(my ideal temperature is 70 degrees), for about 3 hours. Sometimes it takes longer. You can tell when they're ready because they will look visibly puffier. Once they're done proofing, put your croissants in the fridge for about 20-30 minutes to firm up your butter. This step will make sure your butter doesn't leak out during baking. Give your croissants a good egg yolk wash before baking(if using). Preheat your oven to 500 degrees(or the hottest that it will go). Place your croissants on the middle oven rack and turn down the heat to 475 degrees. Bake for 5 minutes and then turn down again to 400 degrees for about 8 minutes. Finally, turn down the heat to 350 degrees and bake until a deep golden brown, about 8-10 minutes. Remove and immediately transfer onto a wire rack to cool. Wait 30 minutes to allow the butter in the croissants to finish it's final setting. Croissants should be eaten barely warm. Croissants HATE warmth! Work in a cool room, preferably 68-72 degrees. If it's too warm where you live, then you might want to rethink making croissants. What will happen is your butter might melt into your dough during lamination and that's a big no-no! Your butter should only melt into the dough during baking! That's what gives your croissants those flaky layers! When my house is 70 degrees, it takes about 3 hours sometimes 3 1/2 hours to double in size(proofing). They should be visibly puffier, then before. When you brush your egg wash on, your croissant will seem to "jiggle". Two reasons why you could have a pool of butter coming out of your croissants during baking: 1) you've UNDERPROOFED your croissants(i.e. you baked them too soon). 2) Before shaping into croissants, you didn't roll out your dough thin enough. About 1/8 inch thickness is best to ensure thin layers of dough and fat. If your layers are too thick, the butter will not be able to fully penetrate the dough, your croissants will be tough, and the butter may leak out during the bake. More often then not, I actually prefer to NOT add an egg wash on top of the croissants. I think w/o it, the croissants puff up better and rise higher. A lot of home bakers tend to undercook their croissants(maybe because the egg wash browns them too quickly? )...that might also be a reason why your croissants end up flat. If at anytime during lamination, your butter seems too soft or seems like it's going to leak, wrap it up tightly and place it into the fridge or freezer for 15 minutes or so, or until firm. To make chocolate croissants, you can purchase chocolate batons online or just do what I did...I used some Bakers chocolate that come in 1 ounce squares. Don't used chocolate chips or chopped chocolate cause they will just ooze out and make a complete mess! Make sure that your dough and butter are the same temperature before lamination. Use REAL butter with a high fat content. A European style butter is best or something with at least 80% or higher butter content. Most importantly, work quickly and HAVE FUN!! Take some strawberry preserves(I like to start with half of a jar), and place it in a small mixing bowl. Add a squeeze of lemon juice. Mix well and repeat with your blueberry preserves. Set aside. 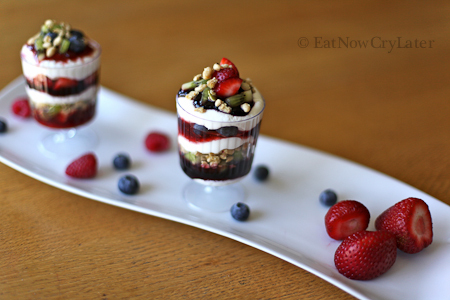 Assemble your parfaits. Start with a dollop of yogurt, some strawberry preserves, some chopped fruit, then finish with some granola. Repeat steps(except this time use some blueberry preserves). Serve immediately. Summer and sunshine calls for summer recipes!! I have so many ideas churning in my head that it's kind of overwhelming me! I mean, I can barely hear the voices in my head, anymore! I had a ton of leftover watermelon the other day, and as I sat there drinking some pomegranate juice, I had the idea of putting the two together, to make a drink. And since watermelon is made up of mainly water, I thought about making watermelon ice cubes to make a delicious and refreshing drink! 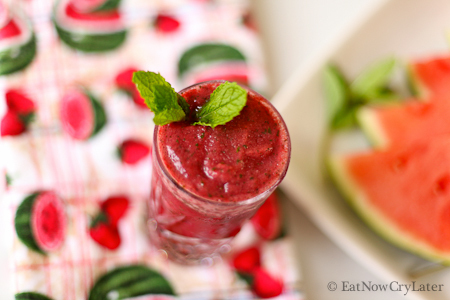 The addition of fresh mint make this drink not only refreshing, but beautiful as well! Yum to pomegranate, right?!? This super fruit is packed with antioxidants and in some studies, have been proven to protect against diabetes and heart disease! Note: This drink will begin to separate the longer it sits, so make sure to pour it into a glass and serve immediately!